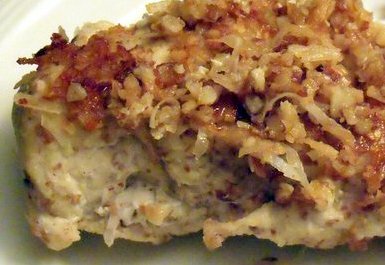 When we were on our first Whole30 last July (2011), my husband said that he would love some “breaded chicken.” I’m sure there’s a recipe like this one out there somewhere, but I just thought I would share what we came up with. It was DELISH! Combine 1 cup of chopped almonds with 1 cup of coconut flakes and a dash of sea salt in one bowl. In another bowl, melt 3 TBS coconut oil. Heat some coconut oil on the stove in a medium sauté pan. In the meantime, dip 4 fresh chicken breasts into the oil bowl (to moisten it), and then into the almond/coconut mixture bowl (you will have to press the mixture into the chicken, and then pile it on top when you put it on the stove). Cook (covered) until proper temp is reached. So juicy and delicious! Definitely a favorite!